A parabolic reflector, dish, or mirror is a device that is used to collect or project energy such as electromagnetic waves. Alter incoming plane waves traveling along the same axis as the parabola into a wave that is spherical and they all meet at the focus of the reflector. The parabolic dish antenna is the form most frequently used in the radar engineering of installed antenna types of. Figure 1 illustrates the parabolic antenna. A dish antenna consists of one circular parabolic reflector and a point source situated in the focal point of this reflector. This point source is called “primary feed” or “feed”. The circular parabolic (paraboloid) reflector is constructed of metal, usually a frame covered by metal mesh at the inner side. The width of the slots of the metal mesh has to be less than λ/10. This metal covering forms the reflector acting as a mirror for the radar energy. 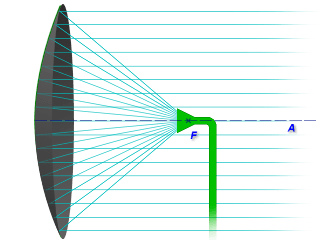 According to the laws of optics and analytical geometry, for this type of reflector all reflected rays will be parallel to the axis of the paraboloid which gives us ideally one single reflected ray parallel to the main axis with no sidelobes. 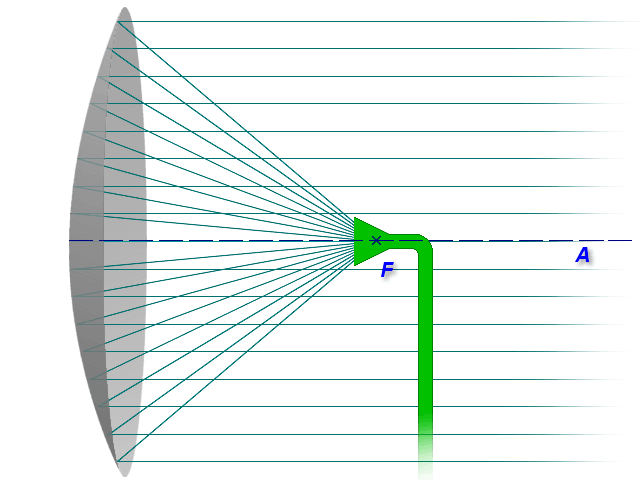 The field leaves this feed horn with a spherical wavefront. As each part of the wavefront reaches the reflecting surface, it is shifted 180 degrees in phase and sent outward at angles that cause all parts of the field to travel in parallel paths. This is an idealised radar antenna and produces a pencil beam. If the reflector has an elliptical shape, then it will produce a fan beam. Surveillance radars use two different curvatures in the horizontal and vertical planes to achieve the required pencil beam in azimuth and the classical cosecant squared fan beam in elevation. This ideal case shown in the figure 1 doesn't happen in the practice. The real parabolic antennas pattern has a conical form because of irregularities in the production. 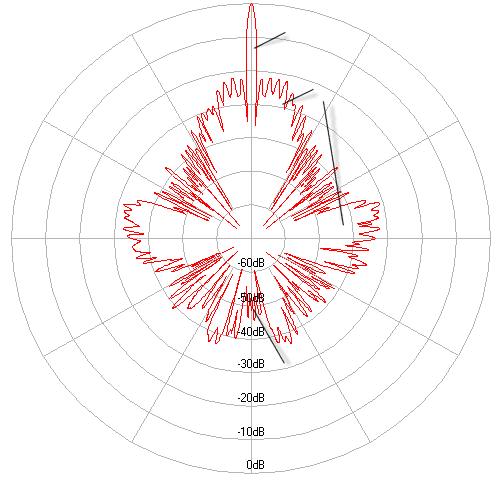 This main lobe may vary in angular width from one or two degrees in some radars to 15 to 20 degrees in other radars. 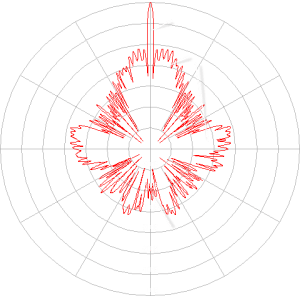 The radiation pattern of a parabolic antenna contains a major lobe, which is directed along the axis of propagation, and several small minor lobes. Very narrow beams are possible with this type of reflector. This is an approximate formula but gives a good indication for most purposes while noting that gain will be modified by the illumination function. Note: The differences between Figure 2 and Figure 4 make sense: in Figure 2 the range is linear, so the size of the side lobes is not recognizable. Figure 4 shows the range in logarithmic scale, the side lobes are so easily recognizable, but the peak of the main lobe is flattened. A “Single Curvature” or 2D-Reflector has instead of a focal point a focal line. Parabola is what you see when you look at the end of it. This parabola is duplicated on a straight line. Type 1022 is an example given for this kind of reflector. 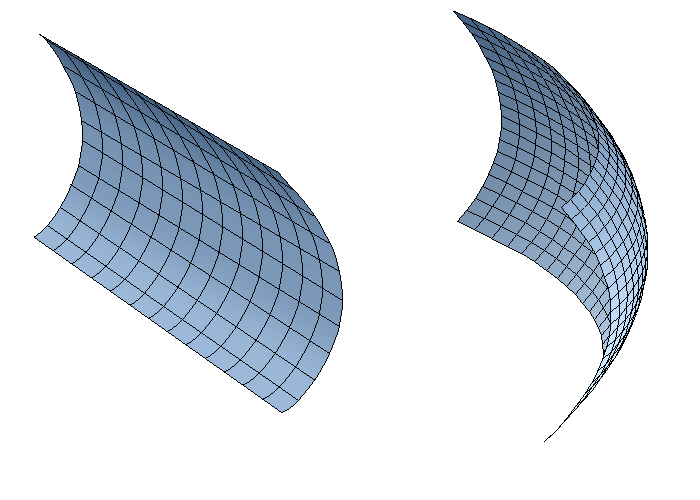 At “Double Curvature” or 3D-Reflector the surface is generated by a parabola revolving around its axis. The parabola can be seen from every aspect angle.